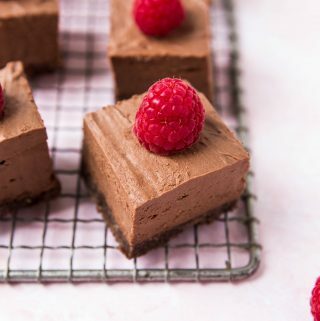 These (gluten-free) no-bake chocolate cheesecake bars are so easy to make. Take these to your next gathering and you’ll be the hit of the party! Make a parchment paper sling for your baking pan. Cut a piece of paper about 13 inches wide (wide enough to cover the bottom of the pan the long way) with enough to fit over the edges. You’ll basically lay the parchment paper on the bottom of the pan so that the paper comes up and over the edges of the pan. This will easily allow you to life the finished bars out of the pan before you cut them. It is easier to cut them when they’re not in the pan. Crush up an entire box of chocolate graham crackers. You can either place them in a Ziplock bag and crush them with a rolling pin or something heavy like a meat tenderizer. The Pamela’s brand were too hard to crush up using that method, so I put them into my Blendtec (or you can use a food processor). I processed them until they were very fine, almost like a coarse flour consistency. Mix the crushed up graham crackers with six tablespoons of melted butter. Layer in the bottom of your parchment paper lined baking dish. Press it down firmly with a spoon or your fingers so that it’s tightly packed. Bake at 350 for about 10 minutes. Cool completely. If you are making your own whipped cream, beat one cup heavy whipping cream until stiff peaks are formed. Add in ¼ cup powdered sugar and one teaspoon vanilla and beat again until well-combined. This mixture makes two cups of whipped cream. Set aside. Place chocolate chips in a microwave-safe bowl. Microwave at one minute increments, stirring after each one, until chocolate chips are fully-melted. You can also use a double-boiler if you prefer. Set aside to let cool a bit. Beat cream cheese, sugar, and butter until smooth and creamy. Gradually add in melted chocolate chips and beat until everything is combined. Fold in whipped cream until blended. Pour this cheesecake mixture over the cooled chocolate graham crust and spread until smooth. Freeze for about an hour. After cheesecake is firm, remove from the pan by pulling up both edges of the parchment paper sling. Then cut into 1-inch squares. You can garnish with berries, small pieces of graham crackers or a little dollop of whipped cream.